Wooden Canoe at Water Dance in Frisco CO Real Estate is where you will find luxury Frisco CO homes near the shores of Lake Dillon. There are 55 single family home lots with only 6 still vacant (as of 2013) that range in size from 0.24 – 0.48 acres. Wooden Canoe at Water Dance Frisco CO homes range in size from 3 – 6 bedrooms with the oldest homes built in 1998. 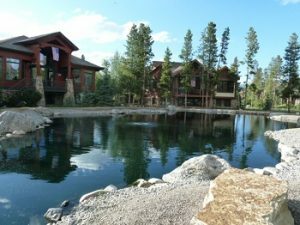 Although only a select few of these homes are located steps from shores of Lake Dillon, Wooden Canoe at Water Dance subdivision in Frisco Colorado boasts many additional water features and small ponds which creates a waterfront ambiance throughout the subdivision. These luxury Frisco Colorado homes are located along the Summit County Rec Path where you can enjoy a brisk walk, run or bike ride. Adjacent to Wooden Canoe at Water Dance is the Frisco Adventure Park for nordic skiing, sleigh rides, tubing and more. If you are looking for a home for sale in Frisco Colorado Real Estate, take a look at the homes currently listed in Wooden Canoe at Water Dance below.